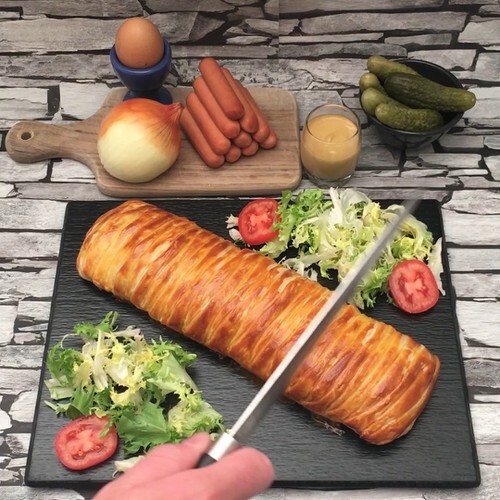 Puff Pastry Hot Dog! A hot dog... to share! Place 8 hotdogs in 2 lines in the middle of the puff pastry sheet, then brush the hotdogs with mustard. Cut the mozzarella into slices and place it on the hotdogs with slices of the pickles. Cut rings of onion and dip them in flour. Fry them in hot oil until golden brown and then add them on top of the pickles. Cut the pastry into strips 1.5cm wide either side of the hot dogs, then braid them alternately across the hot dogs to cover them. Brush the pastry with an egg yolk. Bake the giant hotdog in the oven for 20 minutes at 210° C, then cut it into slices to serve.